The importance of UPS System Battery Room design, construction, and operation? UPS Systems (Uninterruptable Power Supply Systems) are as common today as the personal computer workstations they support. Many companies have UPS systems as part of their Information technology infrastructure. But, do you know the importance of their design, construction, and operation? This damage occurred as the result of a Hydrogen explosion. Wet cell batteries release hydrogen gas as they charge. 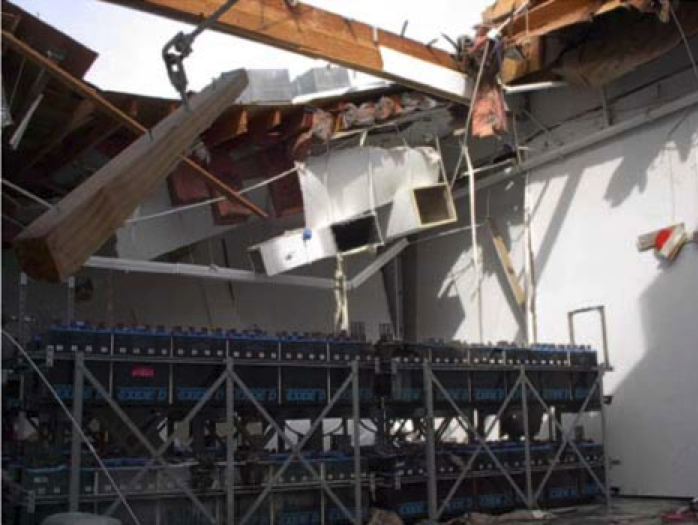 The ventilation system for this battery room was turned off (operator error) allowing Hydrogen gas to build up in the room to a level that once ignited, created an explosion that destroyed a good portion of the facility. Are you planning for a new UPS system, upgrades to your existing UPS, or have a concern about your UPS infrastructure? Reach out to The Great Meadows Design Group, LLC for engineering help for your UPS system.